Why I love the musical Oklahoma! I come from a musical family. I am fortunate in that. 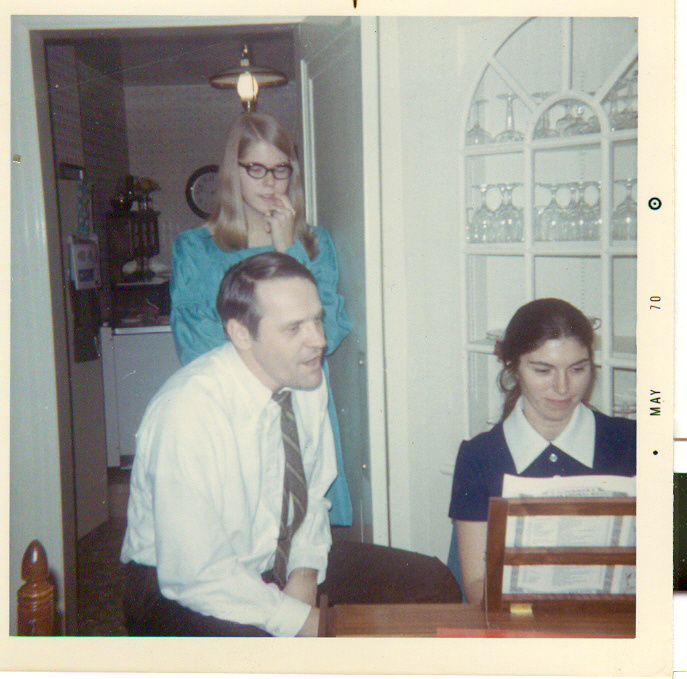 Both of my parents sang; my mother played piano, and my siblings and I were forced to do the same. In spite of our grumbling and complaining, we all grew up to be musicians of a sort and are grateful for it. The piano was the heart of our house. It was played daily. My mother was a firm believer in practicing, which we all did plenty of, but she also played for pleasure. It was necessary for her sanity. She was a stay-at-home-mom with quiet aspirations to do more. (She had been a nurse, but gave it up to raise kids.) Music was her balm, her meditation, her sanctuary. After practicing Bach or Debussy, inevitably my mother would start a familiar show tune, and my father would put down his paper, bound up from the couch, put his hand on her shoulder and sing along. He had a beautiful and distinctive tenor voice. My father was a tad “larger than life,” especially in my eyes, but his singing voice was warm and inviting. Often my mother would harmonize with him. As I kid, I thought this was normal, that everyone’s parents would leap into song in a moment’s notice; only later did I realize this wasn’t necessarily the case. Their favorite songs were from American musicals. Hymns were for church, rock was for the radio, but show tunes were for fun and their melodies filled our family room. My parents had never been to Broadway, but you wouldn’t know it from the stacks of scores and librettos piled on the top of the upright. I grew up listening to the music from The Sound of Music, Guys and Dolls, Mame, Kismet, The King and I, West Side Story, I Do, I Do, The Unsinkable Molly Brown and of course Oklahoma! As I entered my teens, I remember thinking these songs were cheesy and dated. I never understood why my mother (and sometimes my father) would tear up and get emotional when they reached certain lines like, “for here you are, standing there loving me, whether or not you should” or “don’t cry young lovers, whatever you do, don’t cry because I’m alone; all of my memories are happy tonight, I’ve had a love of my own” or “open your angel’s arms, to this stranger in paradise, and tell him that he need be a stranger no more.” After the song was finished, they would kiss and I would roll my eyes. – My father and mother singing, with my sister Mary. As an adult, I get it. Now I understand that lyrics like, “your hand feels so grand in mine” and “out of my dreams and into your arms I long to fly, I will come as evening comes to woo a waiting sky” are close to perfection in that they have both depth and simplicity. Now those same lyrics make me weep. There are a lot of reasons to love this show. Sure, Oklahoma! was the first collaboration between Richard Rogers and Oscar Hammerstein. Sure, it was groundbreaking in that Agnes DeMille (in her first Broadway appearance) created the iconic dream ballet. Sure, it received stunning reviews, and yes, it has withstood the test of time to remain one of America’s favorite musicals. However, for me, I will always associate this show with my parent’s love of music, and their love for each other. Even in the midst of a busy rehearsal, with a million little problems that somehow need to be solved yesterday, I stop in my tracks when I hear “I’ve got a beautiful feeling, everything’s going my way” because I swear I can hear that clear and distinctive tenor voice singing along. *Liz Woodworth is current directing a version of Oklahoma! presented at Stagenorth and opening (gulp) April 26th. Make your reservations now. Love you too mom. And by the way, you look like a baby in that photo. I don’t know how you do it. Honey , this was 40 years ago!!! Your story is beautiful and true of so many of us who grew up on R&H. The tunes will forever bring a tear/sparkle to my eye and strong memories to my heart! awww. what a great photo. sez it all ! I always was awed by Frank’s voice and Josie’s amazing way of “handling” him. Although I was young back then, I always thought they seemed SO young to have grown children. Now I know why…the music. Their gift to their family and the whole community.